Photos by Chanda Brietzke (bottom left), Megan Kot (top left: note large leaves and flat, soft berry), and Wiebe Nijland (right). 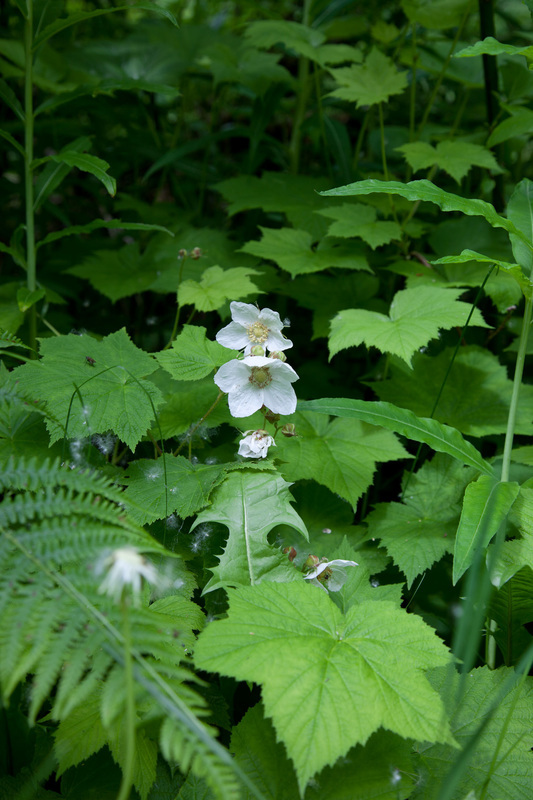 Thimbleberry is easiest to identify when it is in flower or fruiting in spring and summer. The flowers are large, composed of 5 bright white petals, and grow in groups of 2-11 at the top of stems. The red dome-shaped berries are similar to raspberries and are very soft when ripe. Thimbleberry leaves are broad and somewhat maple leaf-shaped, with 3 to 7 pointed lobes. They are covered in a soft fuzz. This shrub grows from 0.5 to 3 m tall. Thimbleberry is generally found in open sites like clearings and shorelines, as well as in open woodlands - particularly ones with red alder. It grows from low to subalpine elevations, and is restricted to lower elevations in the northern parts of its range. Thimbleberry grows from California to southern Alaska on the coast, inland to Saskatchewan, and south to New Mexico. 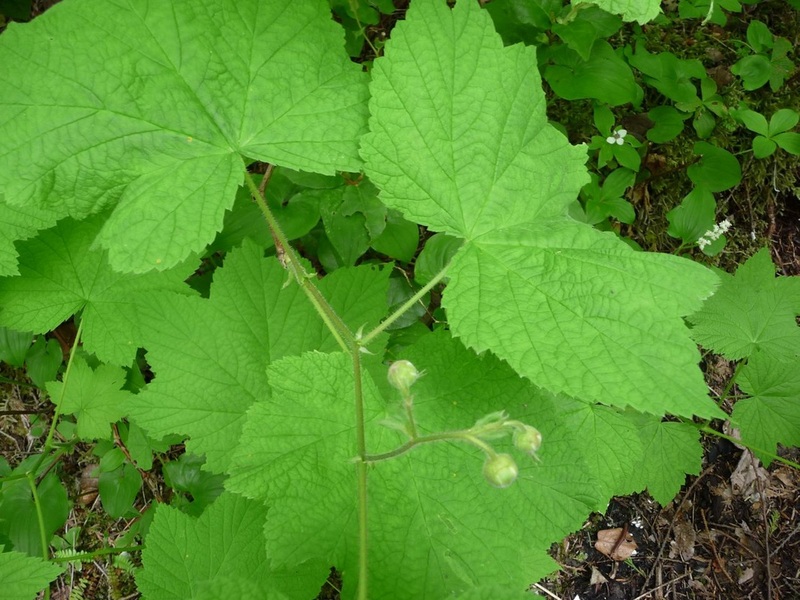 Other plants with large maple leaf-like leaves include devil's club (Oplopanax horridus) and stink currant (Ribes bracteosum). Devil's club is armed with large spines and has small red (inedible) berries, while thimbleberry flowers and fruits are very obviously different from those of stink currant. Stink currant leaves are also more deeply lobed and with more sharply-pointed lobe tips. Thimbleberries are popular with foragers in the summer months. The leaves are large enough to be rolled into cones to hold picked thimbleberries; the leave are also soft enough to act as emergency tissue or toilet paper. 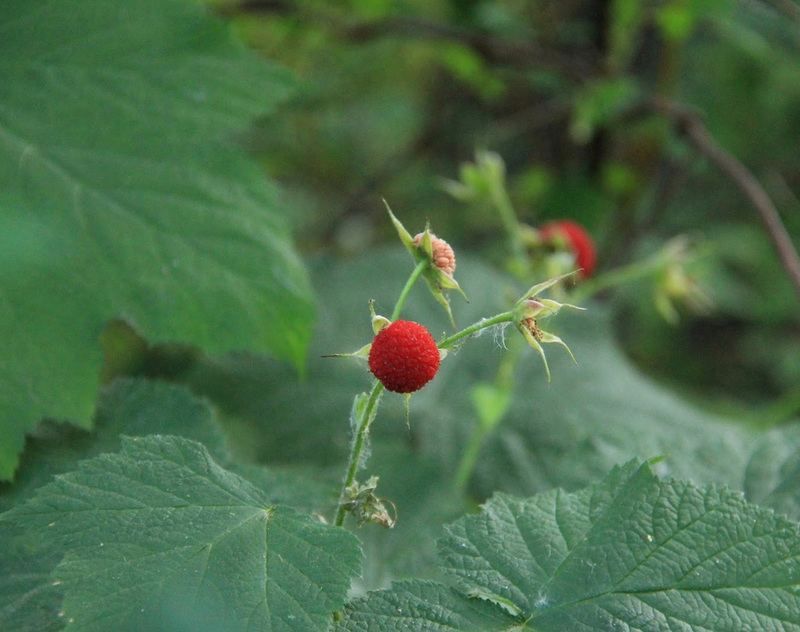 Like salmonberry, thimbleberry shoots were traditionally eaten by coastal First Nations in the early spring and summer before they became more woody and tough. The shoots can be eaten raw, once peeled, or steamed. Pojar, J. and MacKinnon, A. (2005). Plants of Coastal British Columbia, Revised. Vancouver, BC: Lone Pine Publishing. P. 77. Rubus parviflorus Nutt. var. parviflorus. Thimbleberry. In Klinkenberg, Brian. (Ed.). E-Flora BC: Electronic Atlas of the Plants of British Columbia [eflora.bc.ca]. Lab for Advanced Spatial Analysis, Department of Geography, University of British Columbia, Vancouver. Accessed on 17/03/2013.